The Greek people have voted in a landslide to reject further austerity measures demanded by the “Troika” (the European Commission, the European Central Bank and the International Monetary Fund) in return for financial aid that would allow it to continue repaying its debts. This leaves Europe, and indeed the world, in unknown territory; nobody really knows what happens, or can happen, when a sovereign state that belongs to an international currency threatens to default on its debts after rejecting the proposals of the ECB et al. Conservatives and neo-liberals, unsurprisingly, are predicting apocalyptic scenarios; the complete collapse of the banking system and economy of Greece, the confiscation of all bank deposits over €8000 in the country, the expulsion of Greece from the Eurozone and potentially even the collapse of the Eurozone itself. 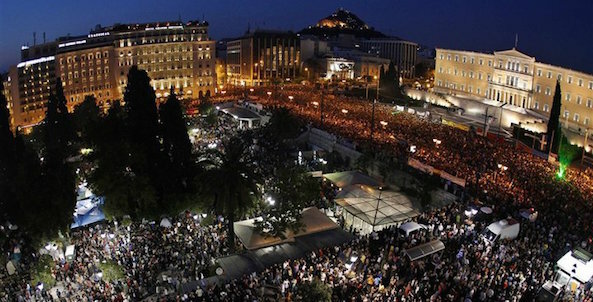 Greece, the neo-liberal lobby wails, is risking the entire European Project through its intransigence. French economist Thomas Piketty is having none of it, and if you read one thing about the Greek situation this week, it should be Piketty’s absolutely searing and on-point interview with German newspaper Die Zeit. Piketty’s core point is that Europe’s success stories in the post-war 20th century were all based on exactly the kind of debt relief which the Troika now seek to deny to Greece. Germany’s debt burden in the immediate post-war era was around 200% of GDP, but within ten years, it had fallen to 20%, largely thanks to negotiations which cancelled huge swathes of German debt. That debt relief was given with the understanding that an economy simply cannot grow and thrive (and thus have any hope of paying off its debts) while it is shackled by enormous public debt, and the so-called German “economic miracle” of the mid-20th century was a product of the willingness of German’s creditors to forgive its debts in favour of peaceful growth and stability. Exactly the same logic was applied as recently as the 1990s, when former Warsaw Pact countries such as Poland (whose political leaders now parrot German’s hard-line on Greece) saw the majority of their huge debts cancelled in order to support their growth and development. Compare that to the situation of Europe’s so-called “PIIGS” – Portugal, Italy, Ireland, Greece and Spain, the countries which lost out most severely in the 2008 financial crash and which were forced by the Troika to assume the enormous private debts of their banking systems as public debts. Each of these cases is different – Ireland, at one extreme, had a very low and manageable level of public debt which was then completely destroyed by the nationalising of debts from the country’s huge, failing banks; Greece, at the further extreme, had serious problems with national debt all along, which it attempted to hide with manipulation of its public accounts, but were compounded by the forced nationalisation of huge amounts of private debt. Each was dealt with similarly, however; the Troika forced the national government to take on private debt from failing banks as public debt, then demanded that the country impose incredibly severe austerity in order to service its now-enormous debt burden. That austerity has been absolutely horrific in its effects. Pensions, education and health budgets and support for the sick and disabled have been slashed. New, regressive taxes which target poor and middle-income people have been imposed. Infrastructure projects have been halted. As a consequence, unemployment has risen drastically (especially youth unemployment, which is now a full-blown national crisis in countries such as Greece and Spain), the economies have shrunk, and the vicious cycle has continued – because a shrinking economy makes it even harder for the government to pay back its debts. It’s all apparently become too much even for the IMF, one of the members of the Troika, which broke with the party line at the start of this month and published a draft report which said what everyone in Greece has known for years – the country’s debt burden is unsustainable. It cannot and will not be repaid. Attempting to torture the money out of Greece – for that is precisely what the austerity measures being imposed right now amount to – isn’t going to work; the astonishing economic pain which countries such as Germany wish to impose on the Greeks will just result in an even smaller economy with even less capacity to pay back its debts. In other words, the left-wing government of Greece, which just received a resounding vote of confidence from its people in the referendum, is absolutely right to reject the Troika’s demands. Whatever happens next, even if it is as bad as the neo-liberal doomsayers predict, will be a short, recoverable shock compared to the many, many decades of stunted growth, harsh austerity and drip-fed ECB handouts that lie in store for Greece in the Troika’s plans. None of this is to say that Greece is a poor, abused and angelic figure; the country falsified its accounts for years. However, it wasn’t ordinary Greek people who have lost their pensions, their healthcare and their public services who did this. It certainly wasn’t young Greeks whose employment prospects have completely evaporated who did it; they were children when it happened. The austerity tortures devised by the Troika would go so far as to extend the punishment to people who aren’t even children yet; decades from now, the private debt nationalised at the demand of Europe’s fiscal masters and the public debt held over Greece like a weighted sword will still be being repaid, at huge personal economic and human cost, by people who haven’t yet been born. This is precisely the scenario that led to the debts of countries like Germany and Poland being forgiven; yet it is seemingly a scenario that moves few hearts in Germany and Poland today. Whether hearts are moved or not may not matter. It’s entirely likely that Greece simply cannot be removed from the Euro, whose currency union mechanisms were originally designed to be irreversible, and that the Troika – already fragmenting thanks to the IMF’s draft report – will be forced to return to the table with the Greek government and work out something different. That “something different” will have to include debt relief in some form; and yes, the rest of the PIIGS will demand that the same rules apply to them. There will be howls of protest from neo-liberals in Germany and elsewhere; but not because some natural order has been upset or some terrible debt-dodgers have been allowed to “get away with it”. Rather, the howls will be because the great neo-liberal con perpetrated in the wake of the financial crisis has failed; the con which demanded that all the money which the wealthy had placed in too-good-to-be-true financial instruments and dodgy banks should be indemnified and protected from risk by the national governments (and thus the ordinary people) of the countries in which those banks were based. The wealthy individuals and corporations threatened ill-defined economic chaos if governments did not allow them to use ordinary taxpayers and public services as “human shields” to protect them from the storm of their own making; governments, in thrall to neo-liberal thinking, acquiesced across the board. If Greece wins its argument with the Troika and receives a debt relief settlement, and the other PIIGS follow suit, it will be a sign that after seven long years, that neo-liberal bluff is being called.